Liquid calcium chloride products are used for anti-icing systems, de-icing, pre-treatment, and pre-wetting. Liquid Calcium chloride is mainly used for anti-ice, pre-wet and road maintenance, including dust control on dirt roads and parking lots. Liquid calcium chloride also has many other applications. The applications are typically industrial and include the concrete feed of tire brine cooling systems, wastewater treatment and as a source of calcium for chemical treatment. The environmental condition of winter can be really disturbing as it disrupts so many activities. This is why Liquid Calcium Chloride is highly essential. It is ideal for antifreeze systems where surfaces are treated before a winter event. This allows a proactive approach to snow control by applying the solution to roads and parking areas. When ice and snow fall, moisture activates the application and generates brine. The frost protection process melts the first few inches of snow. The Liquid Calcium Chloride has proven beyond doubt to be efficient in environmental management. 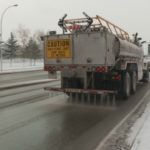 Mechanical rinsing becomes much easier as it reduces the binding of ice and snow on the road, which simplifies the process and shortens the time. Typically, the cleaning blade reaches the coating, allowing for subsequent effective treatments and “hard pack” prevention.